Some three to four hours from Naples (depending on whether you're driving or taking the bus/train) and six south of Rome - not to mention less than an hour from Bari, newly served during the summer season by Iberia Express), the Basilicata region sits right atop the instep of Italy's boot. And in the south of this country's most mountainous region, both its Adriatic coast and inland offer fantastic, otherworldly landscapes. But it's one of Basilicata's major cities, Matera (pop. just over 60,000). And in 2019 Europe's oldest continuously inhabited city - and third oldest in the world - is spending a year in the spotlight as one of the continent's two European Capitals of Culture (the other being Plovdiv, Bulgaria). What is it about Matera that makes it unique in Europe - and, indeed, enough to make it an extra special UNESCO World Heritage Site? Two words that require some explanation: I Sassi. This is Matera's ancient town occupying tuff rock caves lining La Gravina, the gorge below the rest of the city's historic centre. Much of what we see now of these cave dwellings dates back to the 13th century, but they were first inhabited by the Neolithic peoples responsible for the city's status as Europe's oldest - with human settlement dated back to 10,000 BCE. Throughout the Middle Ages locals built their own dwellings not just inside but on top of them, and by the 1950s they'd had deteriorated into an nationally embarassing nest of poverty, crime, and pestilence, so Italy's postwar government forcibly relocated their inhabitants. Today a number of these house restaurants, lodgings, shops, even nightspots, along with an olive-oil museum and cleaned-up period dwellings (such as the Casa-Grotto di Vico Solitario) and scores of preserved "rupestrian" (rock) churches of the Dark and Middle Ages (pictured above). They fascinate me and countless other visitors - and indeed have become the major attraction of Matera tourism, for example lending it the nickname "the Underground City". This district's zigzagging staircases, steep lanes, and tiny courtyards are truly an otherworldly time capsule - so evocative that they've served as backdrop for several movies, such as Ben-Hur, The Passion of the Christ, and The Gospel According to St. Matthew. You can also sign onto tours of the district like "The Cave World of Matera", as well as get a multimedia overview of the history of the sassi and Matera itself at the Casa Noha. The historic centre's mediaeval quarter, Il Piano, sports its own charming maze of cobblestone streets and squares, such as lively Piazza Vittorio Veneto, with several churches, cafés, and Roman remains, and Via del Corso, a shopping high street leading from it to Piazza San Francesco and Piazza Sedile. 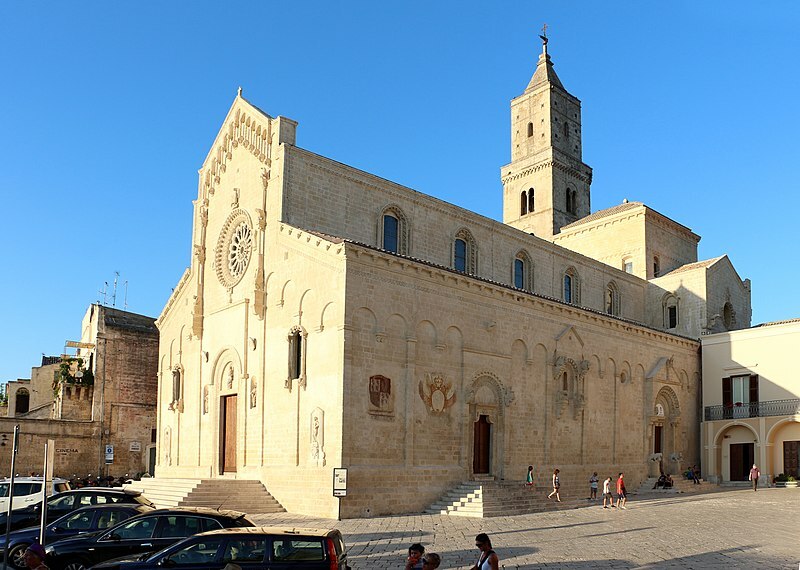 Notable landmarks include the 13th-century Romanesque Santa Maria della Bruna Cathedral (the inside was redone in 18th-century neo-Baroque, but also has older gems such as a Byzantine-style 13th-century Madonna, a 14th-century fresco of the Last Judgement, and frescoed crypts from the 12th century. The early-July Festival of the Madonna Bruna is quite a sight to behold, with its pageantry and spectacular fireworks display. You can also have a look at early-16th-century Tramontano Castle. But apart from the sassi, Matera's most astounding sight is without a doubt the Palombaro Lungo, an enormous, nearly cathedral-like water cistern hewn out of the rock under Piazza Vittorio Veneto in the 16th century; you can book a fascinating half-hour tour in English. There are plenty of other cool churches to visit, too - standouts include the also Romanesque San Giovanni Battista and the 18th-century Baroque Purgatorio Nuovo - as well as interesting museums such as the Museum of Peasant Life; the Domenico Ridola National Archaeological Museum; the mediaeval- and modern-art museum in the 17th-century Palazzo Lanfranchi; and the Museum of Contemporary Sculpture (MUSMA) (housed partly in tuff caves and mostly in the frescoed interior of the 16th-century Palazzo Pomarici). Then a short drive out of town, the theme of the rock churches continues in Murghia Materana National Park, 80 square kilometres (31 sq. miles) set in a dramatic gorge riddled with caves and more than 150 of the churches. A must out here is the Crypt of the Original Sin, considered the rupestrian “Sistine Chapel”, with frescoes dating back to the 9th century (pre-booking a must). And now comes Matera2019, which kicks off this coming Saturday - with themes throughout the year including "Utopias and Distopias", "Continuity and Disruption", and "Ancient Future" - and which promises to be a milestone in the amazing cultural renaissance unfolding in Europe's oldest city. If you're planning a trip to Italy in 2019, I'd highly recommend including Matera in your itinerary; I think it's fair to say you'll be blown away. More info: DiscoverBasilicata.com, VisitMatera.com (the latter in Italian but with a helpful listing of sights).